Find Us - M.M. Bell & Sons Ltd.M.M. 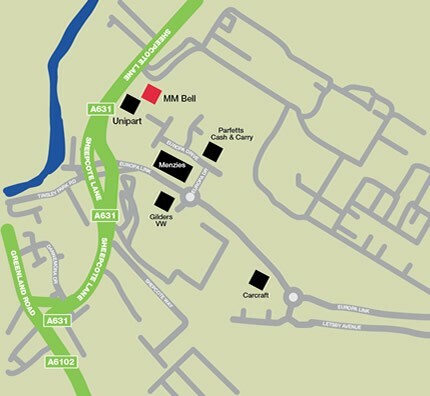 Bell & Sons Ltd.
Find Us. [Click on the maps below to download a larger PDF version]. Leave the M1 at junction 34, then at roundabout take the 1st exit onto the A631 (signposted Chesterfield) At the third set of traffic lights, turn left on to Europa Link. At roundabout take the first exit onto Europa Drive. Turn left at end of the road. At the very end of the road turn right into our Business Park. 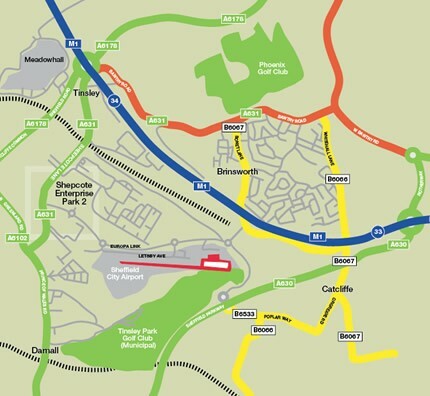 Leave the M1 at junction 34, then at roundabout take the 3rd exit (signposted Sheffield). At roundabout take the 4th exit onto the A631 (signposted Chesterfield A631). At the third set of traffic lights, turn left on to Europa Link. At roundabout take the first exit onto Europa Drive. Turn left at end of the road. At the very end of the road turn right into our Business Park. Head toward M1 on the Sheffield Parkway (A630). Turn off at Airport / Catcliffe exit. Take first exit at roundabout, signposted Tinsley on to Europa Link. Take first exit at second roundabout. Go straight over next three roundabouts (signposted Tinsley) until you reach the roundabout with VW Commercial on your left hand side. Take the third exit on to Europa Drive. Turn left at end of the road. At the very end of the road turn right into our Business Park.